Wisconsin’s Stout Institute is a major landmark of educational innovation in state history. With its emphasis on creativity as well as vocational preparation, the school was greatly influenced by the Arts and Crafts Movement, then a major force in artistic, cultural, and progressive political circles. William Morris, c. 1887. Photograph by Frederick Hollyer. Founded in Great Britain by author, designer, and political activist William Morris (1834-1893), the movement spread to the United States by the late 1880s. 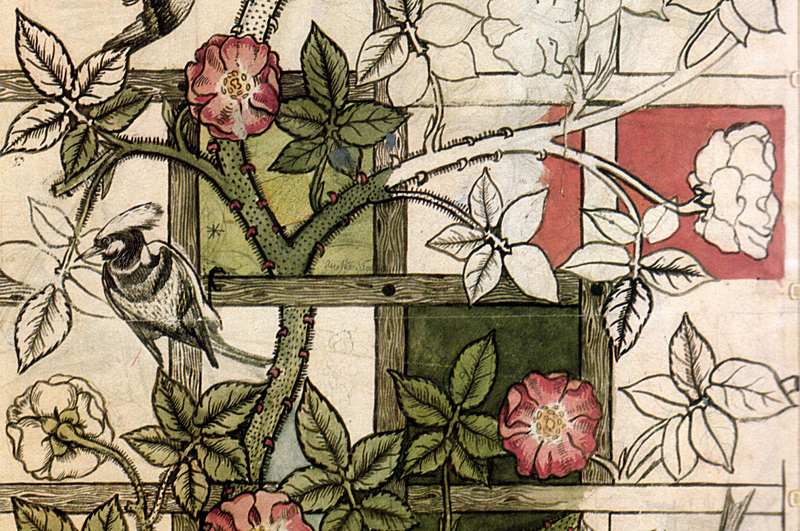 The Arts and Crafts Movement combined nostalgia, higher standards of workmanship for consumer goods, and concern over the poor working conditions and pollution of the Industrial Revolution. The movement also promoted the belief that people benefitted spiritually and emotionally from exercising their creativity, whether as professionals or amateurs. Its participants also demonstrated an enthusiasm for organizing into schools, clubs, and the like. While many Americans embraced Arts and Crafts values of integrity and quality of workmanship, social responsibility, and self-expression through creativity, they usually did not share their British counterparts’ antipathy toward modern industry. Wisconsin’s Stout Institute embodied the American interpretation of Arts and Crafts ideals. The Arts and Crafts Movement held that making things by skilled handicraft rather than by factory labor lead to better goods for consumers through greater job satisfaction and personal fulfillment for workers. Similarly, Thomas F. Googerty, a famed Arts and Crafts Movement blacksmith and seasonal instructor at the Stout Institute from 1910 to 1917, taught metalsmithing to Illinois reform school inmates in the hopes of improving their character. Thomas F. Googerty teaching at the Illinois State Reformatory in 1910. Photograph courtesy of Howard S. Miller. Arts and Crafts practitioners also appreciated medieval style, with the Middle Ages often imagined as a kind of “good old days” when everything was made by hand, and therefore of high quality. That sentiment is evident in a large oak door adorning Menomonie, Wisconsin’s Wilson Place Mansion. The door’s wrought-iron scrollwork and adornments echo medieval styles and metalsmithing traditions. The Arts and Crafts Movement also held that methods of workmanship should be visible in products rather than refined away. The hand of the door’s maker can certainly be seen in its wrought-iron fittings. In both its appearance and origins, this door, while looking rather quaint to us now, manifested some of the most influential artistic and philosophical values of the early twentieth century. According to local tradition, the door was crafted by Stout Institute students to honor the school’s founder, James Huff Stout. The door is so expertly forged, however, that instructor Thomas F. Googerty likely did much of the work. While Thomas F. Googerty was teaching summer classes at the Stout Institute (now the University of Wisconsin-Stout) and likely crafting the wrought iron hardware for the front door to James Huff Stout’s home, other Arts and Crafts metalsmiths were also flourishing in Wisconsin. Cyril Colnik, Coat Rack, wrought iron and deer hooves, c. 1938, in the collection of the Villa Terrace Museum of Decorative Arts, Milwaukee. This piece was created for the Brown Bottle, a European-style tavern operated as a hospitality center for visitors to the Schlitz brewery (now the Libiamo Restaurant, Tavern, and Hall), which opened in 1938. Fixtures incorporating taxidermy, such as these deer hooves, or often antlers, are traditional features in German drinking establishments. The most prominent of them was surely Milwaukee’s Cyril F. Colnik (1871-1958), who provided decorative metalwork for both the mansions of wealthy industrialists and landmark public buildings. A highly skilled craftsman, Colnik also managed a substantial business with several employees, working in a variety of styles to suit the architecture of the buildings his pieces adorned. Many of his works are now on display at the Villa Terrace Decorative Arts Museum. Another important Milwaukee artisan was the jeweler and silversmith Emil F. Kronquist (1882-1974). Kronquist taught summer school at the Stout Institute from 1914 through 1920, when he and Googerty surely must have “talked shop” about their related crafts. Also like Googerty, Kronquist published popular how-to manuals in metalworking. Much of his work is on display at the Milwaukee Area Technical College, where he taught from 1913 to 1951 (when it was the Milwaukee Continuation School). An Emil Kronquist sundial, cast in bronze. The text reads: “The night has a thousand eyes and the day but one.” Photograph courtesy of the Milwaukee Area Technical College. Perhaps the best-known Wisconsin woman involved in the Arts and Crafts Movement was Esther Mabel Frame (1879-1972) of Waukesha. A prize-winning silversmith and jeweler, like Googerty and Kronquist, she too was an educator. Frame taught jewelry, metalwork, and crafts at Milwaukee-Downer College (now merged with Lawrence University, in Appleton). While there, she helped found one of the first occupational therapy programs in the country, which is in keeping with the philosophy of self-actualization through creative handwork promoted by the Arts and Crafts Movement. Of course metals were not the only fields Arts and Crafts practitioners were exploring in Wisconsin. Susan S.G. Frackelton (1848-1932) of Milwaukee was a potter and china painter who won awards at world’s fairs, received patents for inventing a gas-fired kiln, and—like many others involved in the movement—wrote an instruction manual introducing beginners to the rewards of her craft. Susan Frackelton painting a bowl, February, 1901. Photograph courtesy of of the Wisconsin Historical Society, Image ID 8857. By far the most important artistic Wisconsinite connected to the movement was Frank Lloyd Wright (1867-1959) of Spring Green. Without doubt the most famous American architect of the twentieth century, Wright frequently referred to Arts and Crafts Movement founder William Morris in his speaking and writing, and was generally influenced in his practice by Arts and Crafts thinking, especially in his early “Prairie Style” houses. Many of these talented men and women working in early twentieth-century Wisconsin were united not just by a common interest in making things, but also in the belief that the experience of making things well by hand brought benefits to all involved. Through their teaching and writing, several of these Arts and Crafts leaders sought to introduce others to the rewards of self-fulfillment through skilled artisanship. In a similar spirit, James Huff Stout and the educators at the Stout Institute hoped to encourage students’ intellectual development and inventiveness as much as their practical technical skills. Cordasco, Rachel S., “Tried by Fire: Susan Frackelton and the Arts and Crafts Movement in Wisconsin,” Wisconsin Magazine of History, Vol. 95, No. 4 (Summer 2012), pp. 28-41. Evon, Darcy L., Hand-Wrought Arts and Crafts Metalwork and Jewelry, 1890-1940, Arglen, Pennsylvania: Schiffer, 2013. Kendall, Douglas, “Of Craftsmen and Consumers: Wisconsin and the Arts and Crafts Movement, 1885-1940,” Wisconsin Academy Review (Spring 1999), pp. 14-19 (available online at http://digicoll.library.wisc.edu/cgi-bin/WI/WI-idx?type=HTML&rgn=div1&byte=1782029596). Kronquist Artistry Lives on at Downtown Milwaukee Campus, May 2010 (available online at http://www.matc.edu/matc_in_action/2010_Emil_Kronquist.cfm). Strekow, Alan J., Cyril Colnik, Man of Iron, Milwaukee, Wisconsin: Friends of Villa Terrace Decorative Arts Museum, 2011.